Everywhere you go in Cuba, you will find a dish called ropa vieja on the menu. In the case of Cuba, a lot of the new Spanish arrivals hailed from the Canary Islands, where ropa vieja had long been a popular dish. After they settled in Cuba, these colonizers continued to cook ropa vieja. 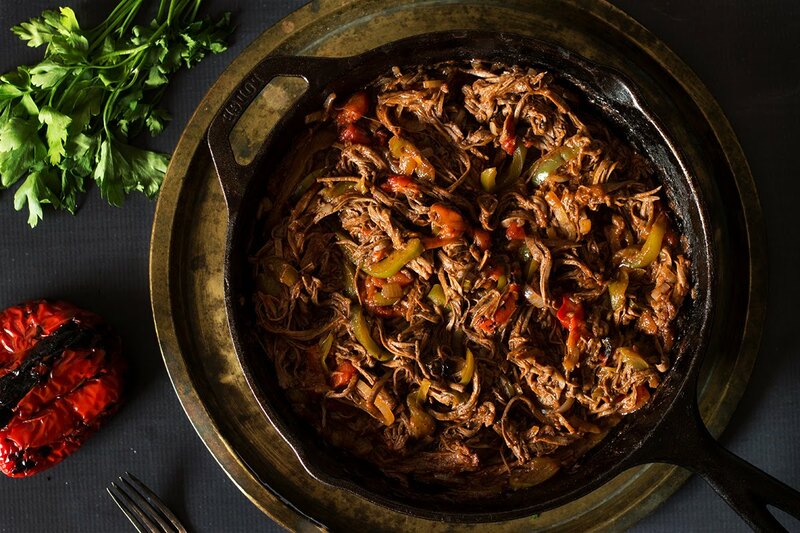 The tradition has lasted for generation after generation, and now Cubans regard ropa vieja as a national dish. Render bacon in a 6-qt. Dutch oven over medium-high heat. Transfer to a plate, leaving fat in pot. Season steak with salt and pepper. Working in batches, cook until browned on both sides, about 6 minutes; transfer to plate. Add onion and peppers; cook until soft, about 4 minutes. Add tomato paste, cumin, thyme, oregano, garlic, and bay leaf; cook until lightly caramelized, about 3 minutes. Add wine; cook, scraping bottom of pot, for 1 minute. Return bacon and steak to pot with stock and tomatoes; boil. Reduce heat to medium-low; cook, covered, until steak is very tender, 2–3 hours. Remove steak, and shred; return meat to pot with olives, pimientos, capers, and vinegar. Cook until sauce is slightly thickened, about 30 minutes. Stir in cilantro before serving.